The best of the bura, a story you can taste, you will find on the Pag island . The story of Pag's cheese and lamb meat is well known with reason. The bura from the Velebit has prevented vegetation on the Pag island and has turned it into a rocky desert, but in return it is washed over with salt. That is why the animals' food gives these delicacies a specific taste that you will turn into a story of your own. The people of Senj are fond of the bura so they have taken it over giving it the adjective - senjska. 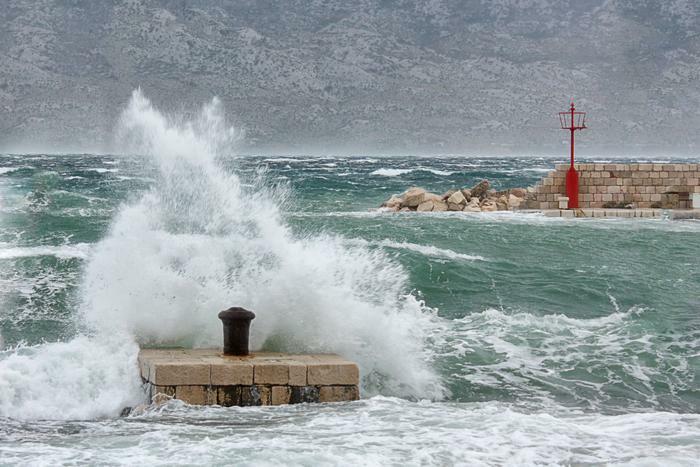 Along with the variety of its tourist attractions Senj proudly carries the motto ''Bura doživljaja'' (Storm of experiences). The locals of Split and Makarska expect three ''March buras'' precisely in March after which they can easily embark into the joy of the warmer days. Physics have recounted and confirmed the story of the formation of the bura where the cold air comes off a steep mountain cliff in touch with the warmer air on the coastal area. This wind storm is most often mentioned by meteorologists warning drivers and sailors about bad weather conditions. In spite, many Croatian writers and artists have dedicated their work to ''bura''. The Croatian writer Petar Zoranić wrote an unverified version of the formation of the bura in the 16th century which is about a beautiful rude girl named Bura that was punished by the fairies because of her pride and boastfulness. That is why the bura roars wildly and fiercely strikes from the mountains.